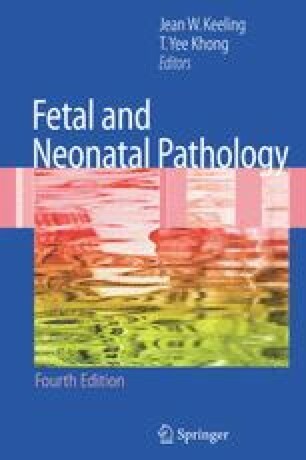 Despite the increasing accuracy of prenatal detection of birth defects and genetic disorders, necropsy still provides the final diagnosis in many cases and serves as an “ultimate audit.” In Berg-er's (1978) view, “any single autopsy may not have dramatic import for progress in medicine, but it may have profound and lifelong implications for helping the dead child's family.” Necropsy results are of great importance to the parents of stillborn infants. In recent years, a fall in intrapartum deaths has been observed as part of the decline in overall perinatal mortality rates in developed countries [Georgsdottir et al. 1989; Confidential Enquiry into Stillbirths and Deaths in Infancy (CESDI) 1997]. Thus a larger proportion of perinatal deaths is now attributable to antepartum causes. Ante-partum stillbirths may comprise more than one third of perinatal deaths (Keeling 1987). To achieve even lower perinatal mortality rates, efforts should be focused primarily on the investigation of antepartum deaths.